The global flat steel market is estimated to be extremely competitive due to the presence of several big and small firms operating regions as well as all over the world. The market is likely to experience a high rise in share owing to high production volume. Some of the key players leading the market are Essar, ArcelorMittal, Voestalpine Group, POSCO, Thyssenkrupp AG, JSW, and JFE Holdings. The firms are investing into merger and acquisitions as the key strategies to sustain their position in the market. MJoerover, in order to improve their regional presence, firms are also focusing on expanding product portfolios which has fueled the demand in flat steel market. Organizations are also concentrating on innovating the new process and also boosting existing ones so as to lessen the impact on the environment, reduce costs, and improve quality. The global flat carbon steel market is likely to expand at a CAGR of 3.8% within the forecast period from 2018 to 2026. In 2017, the market was valued at around worth of US$ 391.46 bn, as per recent report distributed by Transparency Market Research (TMR). In terms of product, the flat carbon steel market is classified into hot-rolled coils, plates, cold-rolled coils, pre-painted steel coils, galvanized coils, and tinplates. On the basis of revenue, hot-moved loops is an exceptionally lucrative segment of the flat carbon steel market. Among these hot-rolled sheets are best for electric machines and vehicles, inferable from their quality and sturdiness. Asia Pacific was the main market for flat carbon steel over the world in 2017. The regional flat carbon steel market is seeing huge development, because of growing demand for flat carbon steel from different end-use ventures in developing nations in the mentioned region. Rise in the investments for infrastructure, heightened investment for infrastructure, and growth in population all over the world are central point driving the segment of building and construction of the flat carbon steel market. Developing imports of machines, for example, horticultural gear in developing nations, for example, Vietnam, India, and Thailand are fueling the demand for flat carbon steel in the segment of machinery manufacturing. Other application portions, for example, appliances, energy, and automobile and transport are additionally growing. The transportation sector is a noteworthy customer of flat carbon steel. 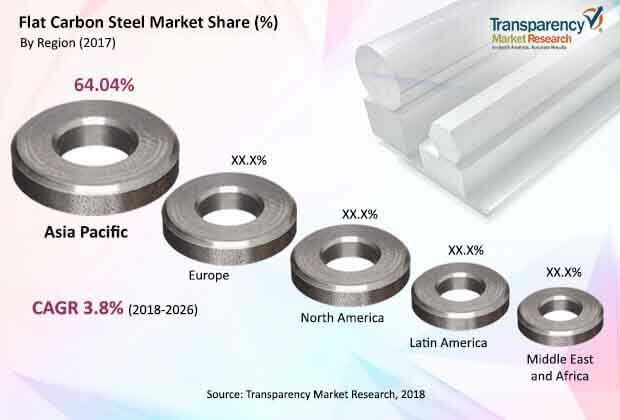 Surging demand for flat carbon steel from marine, automobile, aviation, and railroads industry is foreseen to advance development of the global flat carbon steel market in future. In spite of the fact that utilization of flat carbon steel in the aviation area is low and the automobile segment is getting attracted toward utilization of more lightweight materials, the demand for flat carbon steel in marine and railroads segments is anticipated to stay high in the forthcoming years. The automobile division is seeing a rise in the demand for steel that can diminish weight of cars. This is another factor fueling the global flat carbon steel (FCS) market. Fluctuating cost of raw material is foreseen to turn into a significant market restriction in the upcoming years. This volatility in the cost of raw material is foreseen to hold the entire industry under pressure in the forecast period.